King Zwelithini wants assurance that Ingonyama land will not be expropriated - SABC News - Breaking news, special reports, world, business, sport coverage of all South African current events. Africa's news leader. King Goodwill Zwelithini is against the Constitutional Court ruling legalising the usage of dagga in private spaces. 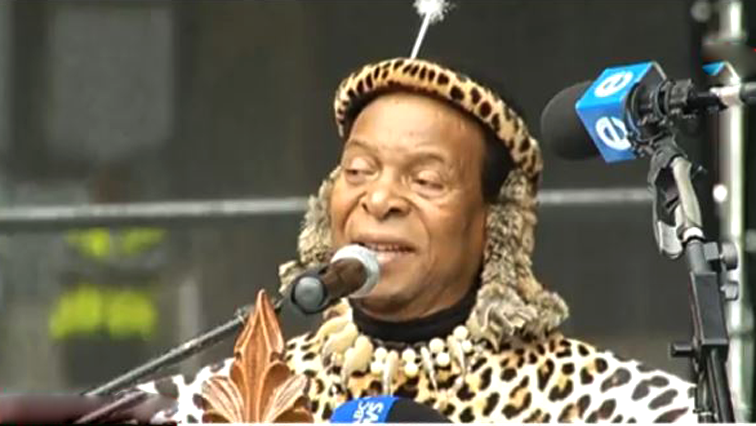 AmaZulu King Goodwill Zwelithini is demanding that government gives him a written and signed assurance that the land under the Ingonyama Trust Board will not be expropriated. Earlier this year during an imbizo, King Zwelithini expressed his fears that his land was being targeted. This comment forced African National Congress (ANC) President Cyril Ramaphosa to hold an urgent meeting with King Zwelithini where he reassured His Majesty that his land is safe. However addressing scores of people during the uMkhosi weLembe at Moses Mabhida Stadium in Durban King Zwelithini said he wants written and signed agreement. King Zwelithini has also criticised the Constitutional Court ruling legalising the usage of dagga in private spaces. He says this will destroy the nation. This entry was posted on 07 Oct 2018,07:46PM at 7:46 PM and is filed under South Africa. You can follow any responses to this entry through the RSS 2.0 feed. Both comments and pings are currently closed.